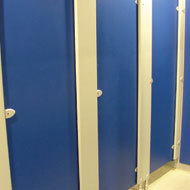 All toilet cubicles are tailor made to our clients’ specification, budget and timescale. We provide simple solutions to washroom challenges by offering a range of products and a quality of service designed to achieve complete customer satisfaction. All cubicles are offered with a choice of hardware designs and finishes. 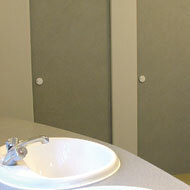 ASFAB shower cubicles are made from 13mm compact grade laminate. Not only is the surface both decorative and hard wearing but being a solid grade it is not adversely affected by moisture and humidity. 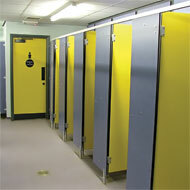 Supplied with either doors or curtains, these cubicles can be supplied to suit any room shape or size. 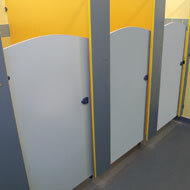 Available in 12/13mm compact grade laminate and featuring an attractive solid black edge profile, these cubicles are suitable for high use areas in wet and high humidity conditions. The durable and vandal resistant properties of these cubicles make this product an investment in the long term. Manufactured using 12mm Swiss Compact Grade Fibreboard (CDF). Possessing many of the qualities of Compact Laminate whilst offering a cost saving this is a good mid range option. (HPL LAMINATE) For medium to heavy use, this high pressure laminate should be considered. HPL is constructed from several layers of paper and bonded onto a timber base core producing a durable and practical component. Features include post formed or square edges with a vast choice of finishes. A good cost effective solution for non-wet areas. Made using 19mm Polyrey melamine chipboard with all edges finished in impact resistant PVC, this product is ideal for light use environments. 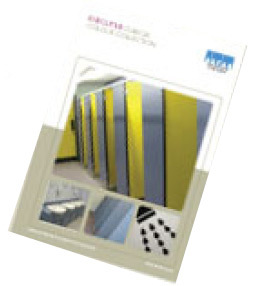 Download a pdf of our wide range of cubicle washroom colour choices. 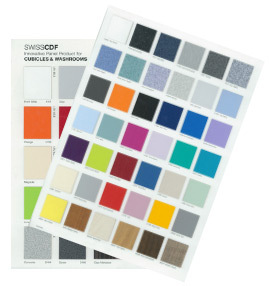 Download a pdf containing samples of cubicle washroom finishes.